Indiana State University is no stranger to helping students navigate their way into adulthood. The university is taking its role a step further as it partners with Covered Bridge Special Education District to help special education students in Rockville, South Vermillion, Southwest Parke and Vigo County School corporations through the Exploring Meaningful Purposeful Living Options and Occupations for Young Adults (EMPLOY) program. "Because of the way the law is written, special education students in Indiana can remain in high school until they are 22. What happens, though, is that that may not be the best place for some individuals at that age," said Carol Wetherell, director of Indiana State's Blumberg Center for Interdisciplinary Studies in Special Education. "The whole idea of this program is to help these individuals gain meaningful employment, so when they get out of the program, they can get a job and live as independently as possible." About 18 months ago, the staffs at Blumberg Center and Covered Bridge Special Education District began looking the possibility for a different option to serve this segment of students and attended site visits to other programs to develop EMPLOY. To be considered for placement in the program, students must be between the ages of 18 and 22 and have completed one or two years in the Community Work Skills program. They must currently attend a function skills program and have independent personal care skills, be trustworthy on the job and in the community, have a desire to maintain paid employment, good attendance, behave in a way that supports safety of self and others, ability to work in a group, willingness to use public transportation, have a recommendation from school staff and case conference committee placement. The program's 10 students were required to undergo an application process, which included references. Students in the program are still a part of their home school districts, even though they have been bused from their home school to the City Center classroom each day since the school opened on Nov. 7. "This was a big adjustment coming to school here, because they were used to the school environment," said Retta Wilson, employment specialist with Covered Bridge. "When they came here, it added that adult life piece, but they've become a close-knit group in a short amount of time. They're getting a different set of experiences here than they did at school, as we get them out in the community, into jobs and learning life skills, like using the bus system and walking to work." Much of the learning is individualized and centered on life skills to allow the students to be successful on their own and on the job. Wilson said she and other Covered Bridge staff visit the work sites to keep an eye on the students, take them to work on their first day and stay in communication with employers while students are placed with their businesses. Once all of the students are assigned to a job site, they rotate being in the classroom for instruction for part of the day and going to work. Placements at the non-paying positions are based on each student's skill set and interests, and several students have already been placed at jobs with Indiana State's Recycle Center, Candlewood Suites, Rollies Pizza and Wise Pies. "I love it at Wise Pies," said student Dareal Johnson, who assists the restaurant two hours a day, five days a week. "I like to toss the dough and help out a lot. I love it. I love working at Wise Pies." While his classmates practiced navigating Terre Haute's bus system on Free Bus Friday to shop for supplies to make Christmas cookies, Johnson opted out of the trip in favor of going to work. When he returned to class that day, he was still beaming about the official Wise Pies work shirt he received Nov. 28 on the eve of his first day dishing up pizzas and salads during the restaurant's lunch rush. "(Dareal) was independent fast, and it's a good feeling to see how much he loves his job," Wilson said. "While some people may say, ‘I have to go to work today', these students say, ‘I get to go to work today.' It's the kind of mindset employers would be lucky to have." Wetherell has reached out to Heather Miklozek, Indiana State's community engagement director, for help making connections with potential placement opportunities on campus and preparing the students for a college campus, which involves getting IDs and the ability to log-on to computers to help with job searches. As a university, Miklozek compared Indiana State to "a small hub for what the real world is like" and a prime place for the students to "adapt to the next stage in their lives." "I was able to connect Carol with places on campus, like the rec center, Sodexo and facilities, where we could bring these students in to areas on campus where they would excel and where people would be able to help guide them to success on the job," she said. "We're also looking for student organizations on campus that would have members who have the skill set to work with this population and would be willing to create a mentor relationship. Indiana State is a safe environment, where they can find the support they need to succeed through peer mentorships that Indiana State students can play a role in." Once everyone is placed at a job, the plan is for students to return to their classroom each day for a "debriefing" to help them connect how work will fit into life after their participation in the program. For now, students will be employed at Indiana State or with businesses within walking distance of the school. As the program grows and partners with more employers, there may be opportunities outside of downtown Terre Haute. "The potential employers are getting an extra set of hands to help mentor and they're providing a much needed service," Wetherell said. "It's like bringing a student in for an internship and helping them gain skills they can transfer out." Ben Manuel began his on-the-job training and skill building at ISU Recycle Center before entering the EMPLOY program this fall. His supervisor, Elizabeth Attebery, supervisor of recycle, moving and setup and waste management, is glad to have Manuel on board at the recycle center. "What the program is doing for Ben and the other students is great, and I'm excited that we can help," said Attebery, who added that Manuel is one of six special needs individuals who work at ISU Recycle Center. "Ben looks forward to coming to work every day, and we're always happy to see him. Everything Ben does, he does it 100 percent. Ben's like a flower blooming. He was shy when he started here, but now he asks questions, and I hope this experience helps him open up even more." When other students in the program head to class in the morning, Manuel walks to work himself but calls the Center City school to assure everyone he made it OK before hitting the shredder around 9 a.m.
"I like the shredding and doing the cardboard," said Manuel, who can often be found listening to music while he works. "I like my job because it keeps me busy." If it is skills and enthusiasm that employers are looking for, then look no further than Brandon Hastings, whose first day at Beat the Heat was Dec. 2. "I like my new job," said Hastings, who helped move boxes at the business. "I am ready to go back on Monday." The student enthusiasm for the program was palpable, even before the school hosted a ribbon-cutting ceremony on Nov. 3 at its Center City location on Wabash Avenue. "The students in the program are really excited. A few months ago, we had a dinner meeting with the individuals selected to participate and their parents and the students were extremely excited. And at the ribbon-cutting, they were already proud of their school before it had even opened for classes," Wetherell said. Many community partnerships were formed as the school got off the ground. Several service providers who deal with services for people with disabilities after they get out school got onboard, as well as the Blumberg Center, which brought Indiana State onboard, The Will Center, Vocational Rehabilitation, InSource, Bureau of Development Disabilities, Vigo County School Corp. and South Vermillion Community School. Since neither computers nor internet accessibility is available at the City Center facility, Blumberg Center is helping students gain permission to access both as Indiana State so they can create resumes, conduct job searches and do career inventories. Thanks to the City Center classroom space donated by local attorney Mike Ellis, classroom furniture donated by Glidden Furniture and cost-free flooring work by David Robinson, a section of the facility that has been fashioned into a mock apartment with a bedroom area, living space and a kitchen, which the class used to prepare a Thanksgiving dinner in mid-November. "It's all been possible because of the community, which has really stepped up to make this happen," Wetherell said. "There has just been a lot of community partners to get this off and running, and I think has made it exciting, not only for the students, but for Covered Bridge to see that the community is supportive of this initiative. Hopefully, it will have the opportunity to grow." 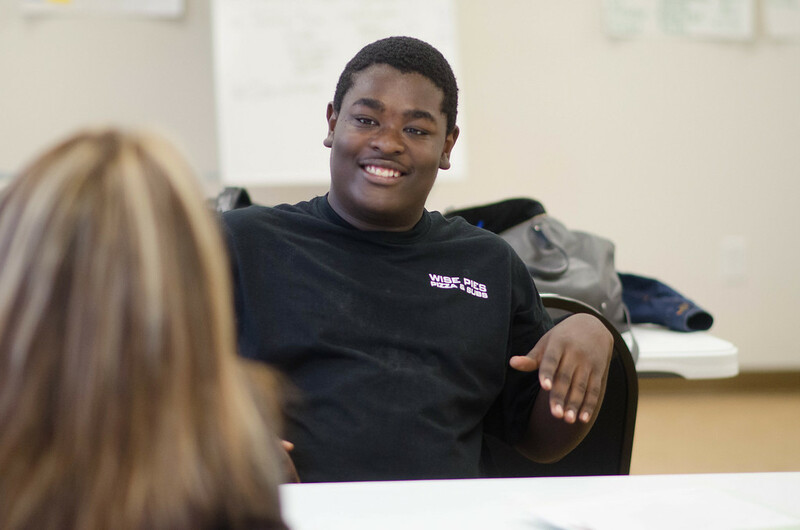 Photo: https://photos.smugmug.com/Events/Events-by-Year/2016/EMPLOY-Newsletter-Interview/i-v2PcXmk/0/XL/DSC_7355-XL.jpg - Dareal Johnson, a student in the Exploring Meaningful Purposeful Living Options and Occupations for Young Adults (EMPLOY) program, chats about his job placement at Wise Pies as part of the Exploring Meaningful Purposeful Living Options and Occupations for Young Adults (EMPLOY) program. Indiana State University's Blumberg Center for Interdisciplinary Studies in Special Education has collaborated with and Covered Bridge Special Education District to offer special education students, ages 18-22, a program to help them gain meaningful employment after high school. Photo: https://photos.smugmug.com/Events/Events-by-Year/2016/EMPLOY-Newsletter-Interview/i-3T4kHTt/0/XL/DSC_7322-XL.jpg - Space in the Exploring Meaningful Purposeful Living Options and Occupations for Young Adults (EMPLOY) program's City Center classroom in downtown Terre Haute is designed to resemble an apartment to help teach students life skills that will allow them to be as independent as possible when the exit the program. Indiana State University's Blumberg Center for Interdisciplinary Studies in Special Education has collaborated with and Covered Bridge Special Education District to offer special education students, ages 18-22, a program to help them gain meaningful employment after high school. Indiana State's Blumberg Center has partnered with Covered Bridge Special Education District to help local special education students life skills to allow the students gain life and employment skills.